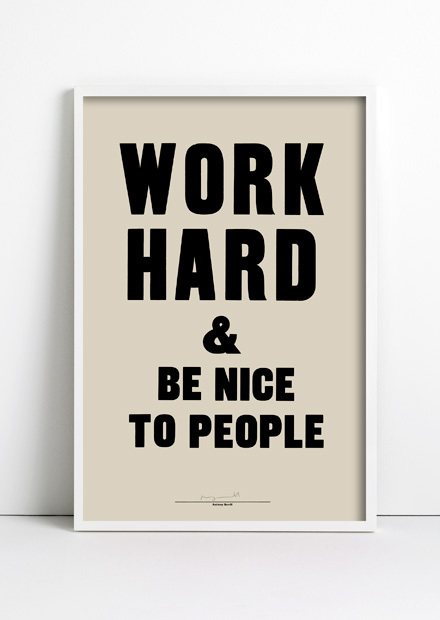 I found this blog which has an entry concentrating on other people who've found that 'Work Hard & Be Nice To People' poster by Anthony Burrill and then went on to muse with a friend, Jude Calvert-Toulin, on our children's and their children's likely destinations in life. Well, the same, Jude. You've made me think a lot. And I'm glad we had the chance to meet again from afar. From early on, being an only child I had a lot of time to reflect on things. And I thought that if we could only teach children not to repeat their forebears' errors we'd have a chance of creating a civilisation that made sense. And thought on the problem that is, how do we learn from the experience of our elders when we haven't had their life encounters and how do we distil the accumulated knowledge/wisdom of mankind into every child so we can be a collective that is better than the generations preceding us? Then realised it must be one of those inscrutable things that people have mused over for generations since time immemorial. Considering that Sophocles et al had made deeply insightful observations about the human condition which got published, disseminated, digested and considered by millions of people, across generations and literally thousands of years, yet we're still searching for answers to the same questions the early philosophers were mulling over and wrestling with since the dawn of consciousness.